(MoneyWatch) No matter what you publish -- a blog, updates to the company website, project reports, or even the venerable tri-fold -- you no doubt need artwork to complement it. Most people run to the Internet in search of photos and clip art, since those images are free and easily accessed. But a lot of those resources are copyrighted, and using them without permission can easily land you in an embarrassing legal confrontation. That's easy to avoid, though, if you know how and where to look for the right kind of images. In a nutshell, you should look for photos and other images which have a Creative Commons license. Creative Commons is the name of a non-profit organization that has developed a number of licenses, all available for free, to help artists share their work. Here's the most important take-away: In general, a Creative Commons license allows you to re-use the image in your own work. There are actually a handful of conditions that can be attached to a Creative Commons license. The artist can choose to allow or prohibit commercial use of their work, allow it to be modified, and they might impose a "share alike" condition. Essentially, that means that anyone who re-modifies the image must also publish that new work under the same Creative Common license. So, how do you find these photos that have Creative Commons licenses? Well, thankfully, the Internet is awash in photos with Creative Commons licenses, but the single best place to look is the photo-sharing site Flickr, which makes it easy for people to license their photos as Creative Commons. 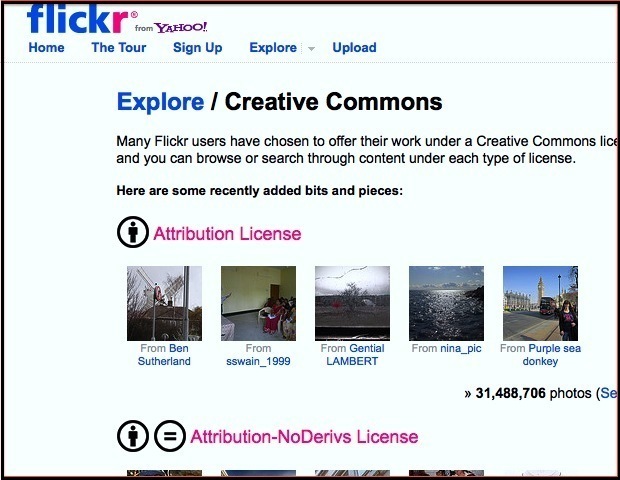 For example, when I need to finds a photo online for this blog, I always head directly to Flickr's search page and select both "Only search within Creative Commons-licensed content" and "Find content to use commercially." Another powerful alternative is the excellent CCFinder. This free program is a Creative Commons-licensed photo search engine that you can use to find any sort of photo by keyword, and then visit the web page it lives on or download the image directly.